On three days experts from 20 countries will present their practical experiences and new developments. Each presentation can be heard in English, French, German, Spanish and Italian language due to simultaneous translation. With participants from 37 countries, he preceding conference held in 2007 has already distinguished itself as the internationally leading conference on these topics. The future of waste management: do we still need waste-incineration? Will there be still mechanical-biological waste treatment in 20 years? Is plasma technology suitable for the treatment of municipal solid waste (MSW)? On the second day, new techniques of mechanical- biological waste treatment and extension and optimisation of existing plants will be the main topics. All kinds of plants will be considered. A special aspect will be fire-fighting in recycling plants. The third day is concerned mainly with topics related to sensor based sorting and waste analytics. 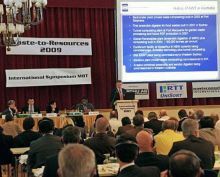 After presentations on the topic of integration of this technique in MBTs and RDF processing, a session about sensor based sorting of recyclables will follow. At the end, presentations will be carried out which are related to material flow analysis (mass- balancing) as well as analysis of waste properties. Methods of different European countries will be compared and a quick test for determination of the degree of biological stabilisation will be presented. On the 15th of may, two excursions are offered that head to an anaerobic MBT and a RDF co-generation plant embedded in a paper factory. On the exhibition taking place parallel to the conference, prominent companies from the area of waste treatment will present themselves.